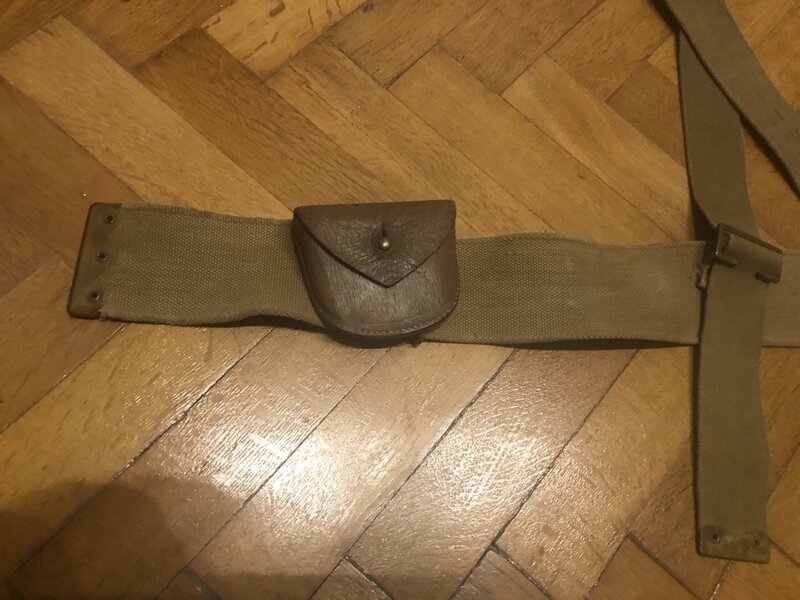 Rarity of P-08 web waist belt 'special'? I would like to acquire an example of the web belt used for pistol equipment. Based on my search thus far that they are thin on the ground compared to the standard 08 waist belt, but how thin? What's the likelihood of finding one, and what should I expect to pay? (your local market prices will be useful). Hard to find. There is one on a dealers site below no idea if this reflects current values. I bought mine some years ago for £200 (when normal 08 belts were £20-30). Wow! Okay, then. I need to start putting money away in the piggy bank. Thanks for the info. Personally, I think that is grossly overpriced and not a brilliant example at that. Should be half perhaps? 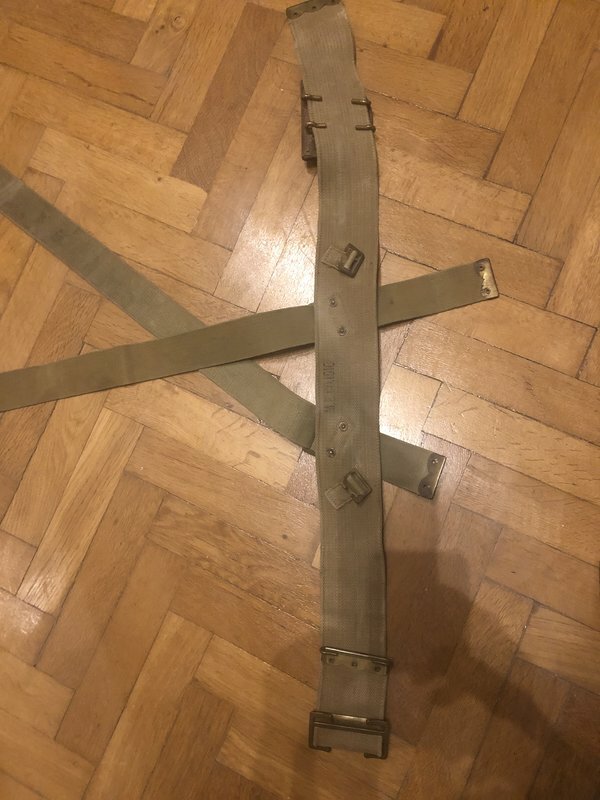 However, having acquired the belt; you will be looking at something like £1000 and possibly upwards for the brace attachments. I think you are closer to the actual value it made my eyes hurt when I saw the price on the site! I just have not seen that many Belt Specials for sale. I must say your estimate on the brace attachments bowled me over but I confess I have not seen any for sale anywhere in 5 years. Alrighty-then. Not a cheap adventure to put the full set together, and some patience required as well. Good to know. I appreciate the guidance. Thank you. I think I better view my example in a new light, if thats anything like the going rate. Interests:The British Army in the First World War. That belt has been sitting on the site for a while and at £800 isn't likely to move in the near future. For those with long memories, the now-defunct Lawrence Corner surplus store in Euston had dozens of these in unissued condition and all dated 1918 in the 1980s when nobody knew what they were. Can't remember how much they were but I doubt it was more than a tenner. I'm surprised that price hasn't brought some of them out onto ebay. For those of us that are a bit older, its amazing where some of the things have gone. In the 80s a Leeds amateur dealer had a large trunk of unused P14 pouches, at GBP30 a pair. He must have had a couple of hundred at least. Where are they now ? Again in 1988 Blunderbuss had full sets of P14 leather, which had been made for an army tattoo in the 1960s. The buckles and rivets were wrong, but they were being sold as a "representation", not as originals. They had lots of these, many dozens. I have not seen a set anywhere for years. I can understand that the old surplus stores were cleared out and lots of gear went to landfill, but so much from the 70s, 80s and 90s that people paid good money for just seems to have entirely disappeared. I recall I paid around £750 for my complete set - and that was 20+ years ago. It's one of the sets shown in Campaign 1915 - assume Chris won't mind me sharing the image. Thanks GT, permission to drool! I have just acquired the 1918-dated belt, waist, special, Mark II pictured below. The information shared in this thread was very useful in helping me source this example (and, no, it's not the one listed at the dealer in the one response earlier in this thread). Green blanco'd, and found here in Canada for significantly less money than that example, and with the added bonus of being marked to a Canadian Sergeant who served in the 4th CMGC. His records, found online, show him receiving treatment for a gunshot wound to the buttocks in June of 196. Thanks for the info. While I have a 1917-dated P-08 ammunition pouch, and a Mk V Webley (which started this whole journey), the search will continue for the other bits. Very nice. Its always a good feeling to find that elusive piece and at a good price. I actually have a set of the P14 from Blunderbuss, bought about 1992. I thought they were for the National Army museum originally but they didn't take all the sets. I'm sure the owner said that , while the leather was new, it was made by the same company as during the war (Lillywhites?) but all the brass fittings were original. It is now 30 years since I looked at them but check the 1-inch buckles on the back of the waist belt and the back of the ammunition pouches. Interests:The acquisition of 'old military junk'. My best guess is that it was a set sold off by a theatrical costumiers circa the late 1980's. Ross, will do, but excuse my ignorance, what am I looking for? The 1-inch buckles are cast brass with a steel tongue. They are round in cross-section with all 4 corners of the buckle with round corners. 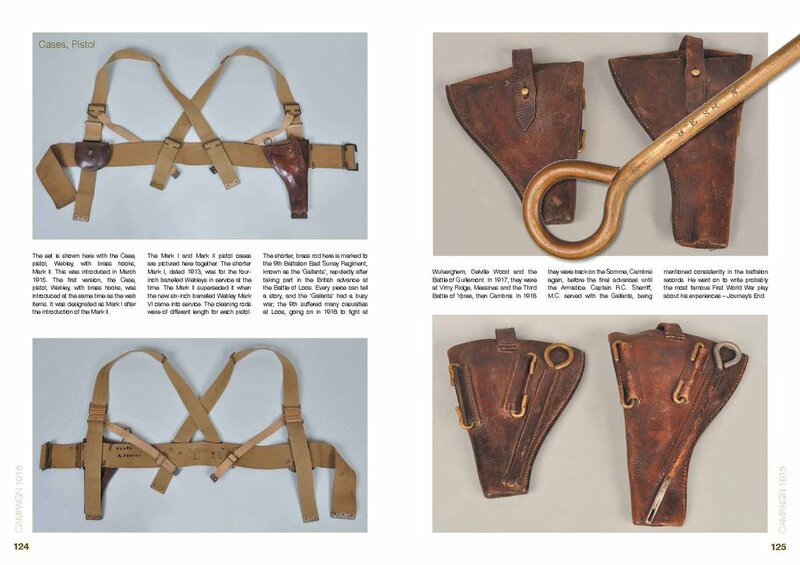 The equipment sets I remember at Blunderbuss, had buckles that were very similar to the correct buckles and of similar manufacture however two corners of the buckle were "squarish" rather than being round. Similar to the buckles on some cavalry harness. I presumed that they had had difficulty obtaining the correct buckles and chose something that gave a good match but was still being manufactured. The set I examined had no markings anywhere. The difference between a reproduction and a fake. They had not been manufactured with the intent to deceive and defraud. In hindsight it was a pity that there were not marked with a "NATO" equipment number, manufacturer and year of manufacture. Then anyone passing them off as WW1 would clearly demonstrate a criminal intent. There are many versions of 14 pattern equipment from numerous manufacturers both in the UK and America, some have brass buckles and brass tongues, the steel ones are a manufacturing variation. 1918-dated Belt, waist, special named to a Sergeant in the Canadian Machine Gun Corps, a 1917-dated ammunition pouch, an un-dated but broad arrow-marked pistol case Mk II, 1918-dated web braces, Military Heritage Workshop repro brace attachments and the 1915-dated military contract Mk V Webley. The pride of my, very small, collection. Will trot it out to the range on occasion. What a lovely looking set! Very nice indeed. Only the pistol case and braces are original in my set. Minor note: shouldn't the ends of the braces at the front be tucked back behind the brace attachments through the loop in the middle? My belt special and ammo pouch. 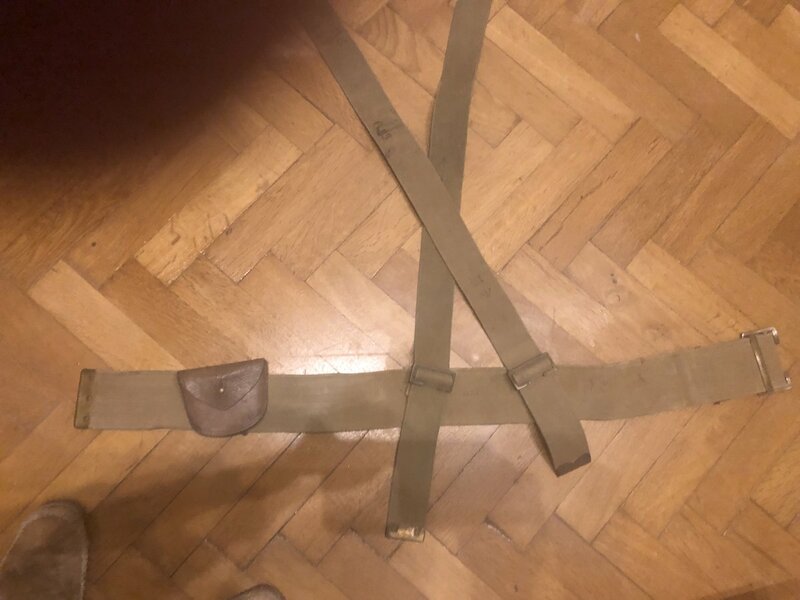 I have the correct holster 1917 dated too but it’s away from the set at the moment. Agree that the belts are rare, but not as rare as the braces! Good spot. I missed that. Thank you. Now remedied and it certainly tidies things up. Nice to see some other belt, waist specials in the thread, and to know they're out there. This is the only one I've ever come across to purchase in this neck of the woods. I'm thinking I might have to blanco the repro straps to help them blend in a bit more.